The older I get, the more my conscience niggles me about things that would have never crossed my mind in my early twenties. Our generation is the first that grew up with fast fashion; we were, and are,able to get our mitts on designer-influenced duds at rock-bottom prices. And if you’re anything like me, you took advantage of this. I used to definitely subscribe to the quantity over quality mode of buying, treating myself to new clothes on a weekly basis. The bulk of which would be worn once, never to be seen again – sound familiar? Now I’d rather buy less, maybe spend a bit more, but certainly I think about clothing that will have longevity. Now I’m not saying we all become eco-warriors, start boycotting Topshop and only wear hemp BUT I think we could all be more considered when buying and caring for our clothes. No person needs 50 dresses, why not buy fewer that you really, really like? We’ve lost the skill of caring for our clothes and treasuring them, so I think a change is in order. I love fashion, but the current trend for fast fashion is no longer sustainable. With that in mind, here are some ideas for us all to lesson the impact of our insatiable thirst for fashion. When we buy lots and we buy cheap, there’s a always a cost; the sweatshop labourers in India, China or Pakistan who work incredibly long hours, in unsafe factories for a pittance. The environmental impact and CO2 emissions from the production of synthetic fibres and the vast machines used to create the clothing. And the landfill when we inevitably throw these poorly-made garments away – they are often made of cheap, easy to care for, man made fibres like acrylic and nylon (which are essentially plastic) that aren’t biodegradable. Do you repair your clothes when they fall apart or get tears or lose buttons? Or do you just throw them away? Our parents and grandparents would care for their favourite clothes and patch, mend or darn them for years – extending their lifespan and removing the need to keep constantly buying replacements. If your garments are terribly made and alway fall to bits, maybe consider buying better quality so you don’t have to keep replacing them. 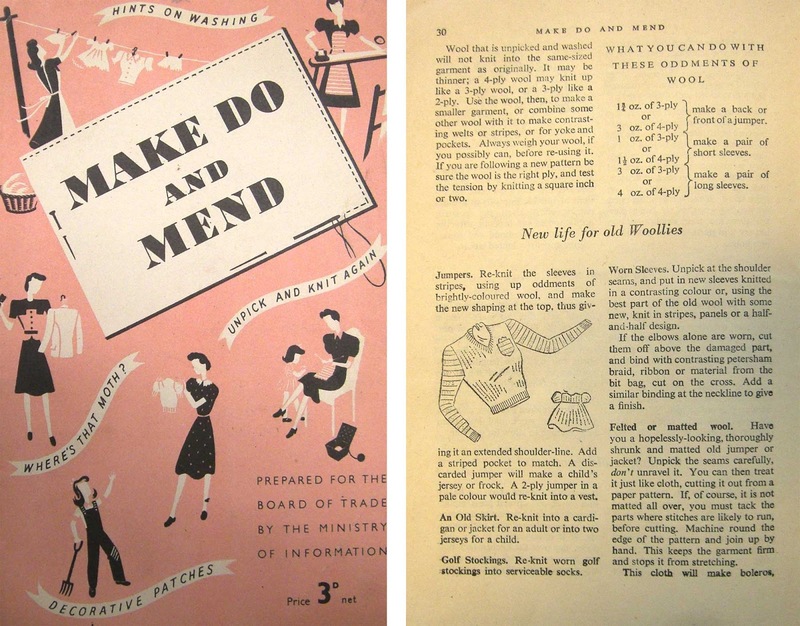 A Make Do & Mend book from the 1940s. Always follow the washing and drying instructions. Dry clean more expensive items like coats and cashmere. Hang clothes carefully – don’t use wire hangers. Keep a sewing kit with any spare buttons, beads or sequins from clothes. Tailors are quite inexpensive, use them to make minor repairs and alterations. Reformation is an American brand who pride themselves on offsetting their carbon footprint, completely. They also repurpose vintage fabric, make all their garments in their own eco-friendly factory where employees are paid fairly and working conditions are above standard, and educate their buyers about ‘green’ fashion‘. Aside from all that, their clothes are gorgeous, like super nice, proving that eco fashion isn’t all burlap sacks and Birkenstocks. Swedish retailer H&M have an initiative whereby customers can drop off their unwanted clothing in exchange for a £5 voucher to use in-store within 6 months. They’re also currently running a $1m competition to find a new solution to recycling their clothes and creating a sustainable fashion model. They do try to recycle the donated items at the moment but due to lots of cheap fashion items being made from mixed fibres, this is proving difficult. 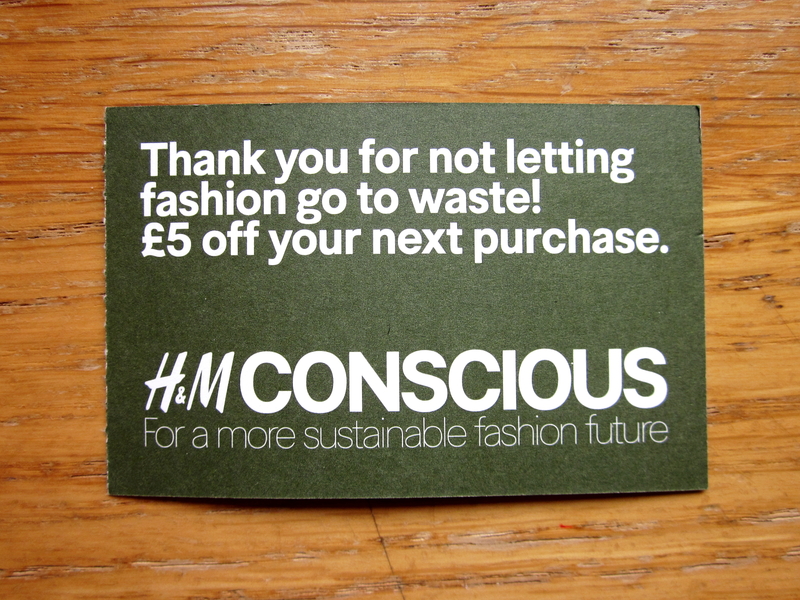 A voucher from H&M, if you donate a bag of clothes, you get £5 off your next buy. Can they be repaired or cleaned? Can they be altered or customised? Cut off jeans. Dye tees. Use iron-on patches. Can you resell the item on Vestiaire Collective, eBay or Depop? Can you sell it at a car boot sale? Can you donate the item to charity or a clothing bank? Can you use the fabric for something else? A craft project/cushion cover? If all else fails use old t-shirts as cleaning rags! 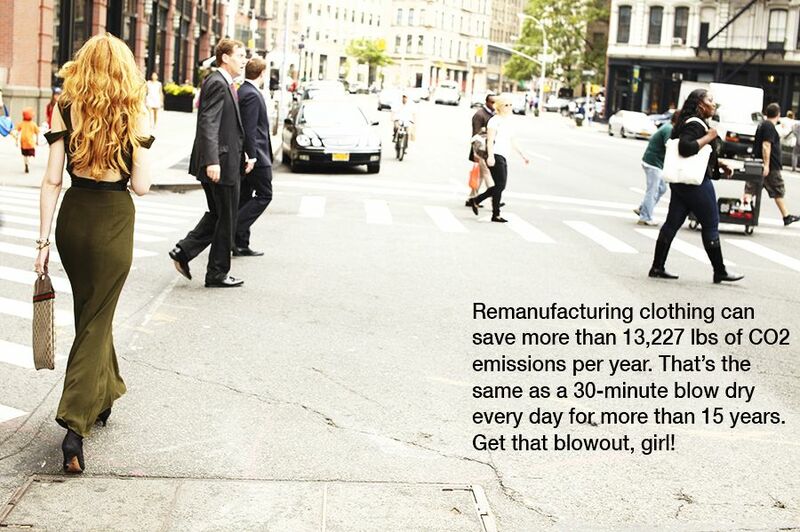 How do you feel about fast fashion and the impact it has on the environment, and what do you do to combat it? Even if you only do a tiny bit, every little bit helps – lets treasure our clothes more, buy less, buy smart and look after what we’ve got.